We’ve now collected just over 200 responses and combined your rankings. Although the distributions were pretty similar, and all the options had plenty of people choosing it as their favorite, one of the options jumped out as a pretty clear leader (at least in this rather informal poll). Bars – the galaxy kind! Of course, the list we asked people to choose from is by no means complete, especially if you include not just the main Galaxy Zoo but also its related projects. In the “Other” box we had a variety of entries, with some mentioning galaxies found in Radio Galaxy Zoo and others citing those seen in Galaxy Zoo: Bar Lengths. Plenty of people mentioned galaxy mergers, and gravitational lenses got a few mentions too! If we had a complete list the rankings would likely be different, but then again, that would be such a long list I’d be worried many fewer people would want to answer. I do not spend a lot of time here, but when I have the time, I love it. Thank you! What a great way to feel like a scientist. 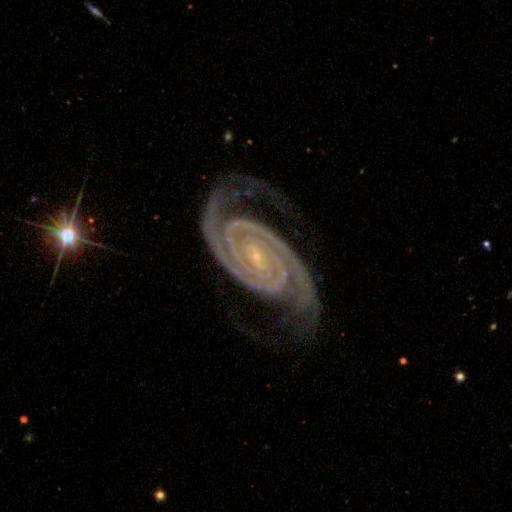 I’ve been an on-and-off participant in the Zooniverse citizen science projects since I was 13 years old – and Galaxy Zoo has been one of my favourites for a while! I just wanted to say thank you for providing the opportunity for an ordinary teenager to feel included in fascinating scientific research – that experience has inspired me to pursue a degree in Physics and Astronomy in the fall. We were also curious about who, as a group, we were asking these questions of. It turns out that quite a large fraction of people who responded to the survey have been with us since the early days, which is so lovely. And we were also delighted to see people engaging with us who’ve just recently discovered Galaxy Zoo. We are so glad all of you are collaborating with us; here’s to many years to come. P.S. – The big 10 is coming next year… what would you like to see for the occasion? Next up in our series of eight blog posts celebrating eight years of Galaxy Zoo is this post from Tom Melvin, who was the lead author of the the first publication from Galaxy Zoo: Hubble, which looked at how the fraction of barred disk galaxies has evolved over the last eight billion years. Tom is also the first person to write a PhD thesis substantially based on Galaxy Zoo classifications, which he is in the process of completing final corrections for. 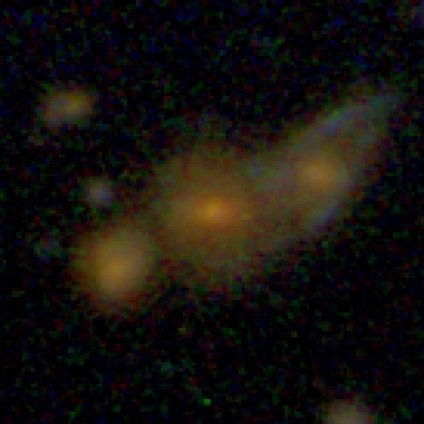 Barred disc galaxies at high redshift identified by Galaxy Zoo Hubble. 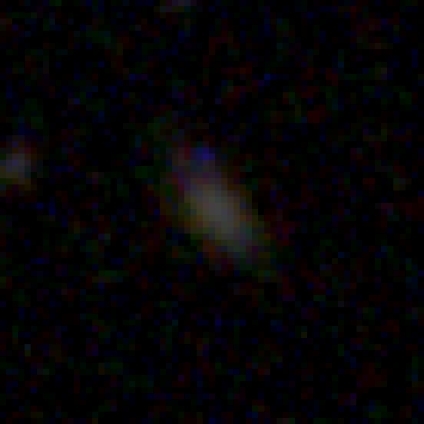 The redshift (‘z’) and the fraction of volunteers identifying a bar (‘Pbar’) are noted in each image. This was the first time the Galaxy Zoo volunteers had been asked to classify galaxies taken by the Hubble Space Telescope, which provided beautiful images of galaxies whose light has taken up to eight billion light years to reach us! With your classifications, we were able to select a sample of disk and barred disk galaxies, as shown above in Figure 1, and explore how the fraction of disk galaxies that are barred has evolved over the last eight billion years. 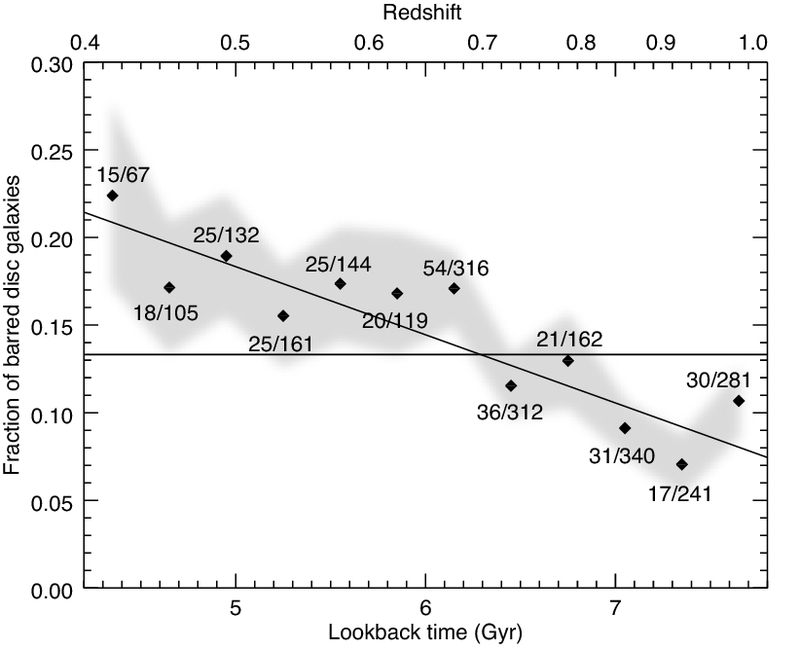 We found that this bar fraction has been increasing as the Universe has grown older, doubling from 11% eight billion years ago to 22% four billion years ago, which is shown below in Figure 2. We also know from Galaxy Zoo 2 that this continues to increase, with around one third of disks having a bar in our local Universe. We were able to expand on this by showing that it was the most massive disk galaxies that were the driver of this evolution. 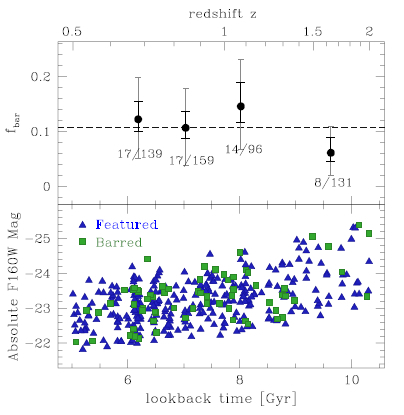 Redshift evolution of the fraction of barred disc galaxies. Each point represents the observed bar fraction in a 0.3 Gyr bin, with the number of barred disc galaxies and total number of disc galaxies indicated. The grey shaded region indicates the error on the measurement. We show the mean bar fraction for the whole sample (fbar = 13.3 ± 0.7%) as the horizontal dot-dashed line, as well as a linear relationship between the bar fraction and the lookback time which is shown by the solid line. As bars tend to only form in disk galaxies that are settled and relaxed, or ‘mature’, our results showing an increasing bar fraction over the last eight billion years tells us that the disk galaxy population has matured as the Universe has aged. As this evolution is being driven by the most massive disk galaxies, we were able to conclude that the most massive disk galaxies become mature sooner than their lower mass counterparts. In addition to these results, we were able to identify a population of ‘red spiral’ galaxies thanks to your classifications. These red spirals’ would typically be omitted from other disk samples, as they would be classified as elliptical galaxies – but as you can see below, these are clearly beautiful red spiral galaxies! What is interesting about this population of disks is that their bar fraction of 45% is much higher than the bar fraction of the whole disk sample, which is roughly 14%. Images showing 3 unbarred (images a − c) and 3 barred (images d − f) “red spiral” galaxies from Galaxy Zoo Hubble. So, thanks to your help classifying the amazing images from the Hubble Space Telescope, we were able to track the evolving bar fraction of disk galaxies over the last eight billion years. There is plenty more to be done with this sample of galaxies, so keep an eye out for future results looking at how galaxies have evolved over the past eight billion years! 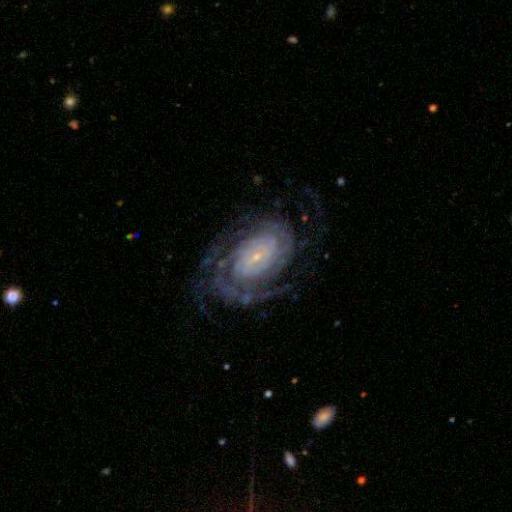 We are pleased to announce that a Galaxy Zoo project is one of the first projects built on the new Zooniverse! Several years ago we measured the lengths of galactic bars in relatively nearby galaxies in the Sloan Digital Sky Survey, and Ben Hoyle wrote an excellent paper presenting new an interesting results on how bars, which are a distinct feature caused by a change in the nature of the orbits of some of the stars in a galaxy, relate to other physical properties of the galaxy, such as color (indicative of recent star formation) and the nature of spiral arms or rings. That work showed the power of measurements like these, which are not always easy for computers to get right. Today, we’re hoping you’ll help us extend that set of detailed galaxy measurements into the distant Universe, with measurements of bars in about 8,000 galaxies from our previous projects using Hubble Space Telescope data, including the AEGIS, CANDELS, COSMOS, GEMS and GOODS surveys. We’ve deliberately been pretty broad in our selection of galaxies which may have a bar, so the first thing the project asks you is to confirm whether you think the galaxy does indeed have one. 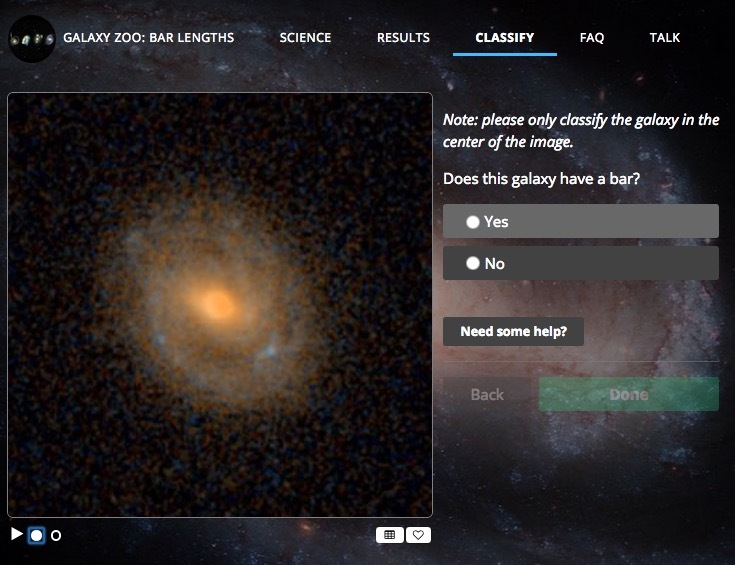 There are many examples of barred and not-barred galaxies (including examples of sort-of-looks-like-barred-but-actually-isn’t-and-here’s-why) included in the project, and you can access them anytime by clicking the “Need some help?” button. 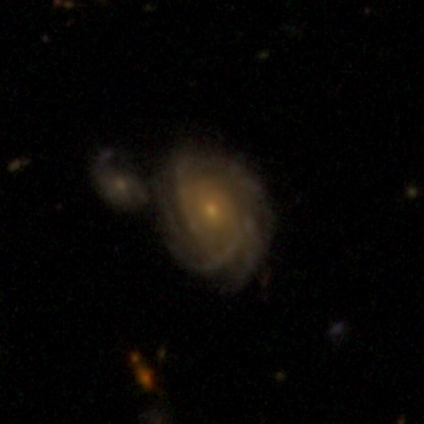 We’ve also zoomed in on the central galaxy to make it easier to classify. If the galaxy doesn’t have a bar, then you can move on to the next one. If it does, there are some follow-up questions about spiral arms and rings, and then we ask you to draw 2 lines on the image: one for the bar width and one for its length. You can also join in the discussions after the classifications with our new Talk discussion tool, which is completely separate from the main Galaxy Zoo Talk (just like the rest of the project). On a more personal note, this is a big step forward for the Zooniverse as a whole. The first draft version of this project came together in under 1 hour back in April. Afterward, we shared project links between science team members and iterated back and forth on the right questions to ask and the right data to use. This process would normally take at least 6 months and require a lot of one-on-one time with a Zooniverse developer. Instead, because the Zooniverse development team has done a brilliant job creating a Project Builder that’s flexible, powerful and also easy to use, we were able to create a new project in a way that’s analogous to, well, creating a blog. What’s all the fuss about bars in galaxies? Since our discovery in 2010 that the red spirals identified by your classifications in the first phase of Galaxy Zoo were twice as likely to host galactic scale bars as normal blue spirals, a lot of our research time has focused on understanding which types of galaxies host bars, and why that might be. Barred spiral, NCG 1300, observed with the Hubble Space Telescope. Our research with the bars identified by you in the second phase of Galaxy Zoo continues to gives us hints that these structures in galaxies might be involved in the process which quenches star formation in spiral galaxies and through that could be part of the process involved in the reduction of star formation in the universe as a whole. We’ve also used your classifications as part of Galaxy Zoo Hubble and Galaxy Zoo CANDELS to identify the epoch in the universe when disc galaxies were first stable enough to host a significant number of bars, finding them possibly even earlier in the Universe than was previously thought. Last Friday I spoke at the monthly “Ordinary Meeting” of the Royal Astronomical Society, giving summary of the evidence we’re collecting on the impact bars have on galaxies thanks to your classifications (a video of my talk will be available at some point). This was the second time I’ve spoken at this meeting about results from Galaxy Zoo, and it’s a delightful mix of professional colleagues, and enthusiastic amateurs – including some Galaxy Zoo volunteers. Prompted by that I thought it was timely to write on this blog about what these bars really are, what they do to galaxies, and why I think they’re so interesting. I wrote the below some time ago when I had a spare few minutes, and was just looking for the right time to post it. The thing about galaxies, which is sometimes hard to remember, is that they are simply vast collections of stars, and that those stars are all constantly in motion, orbiting their common centre of mass. The structures that we see in galaxies are just a snapshot of the locations of those stars right now (on a cosmic timescale), and the patterns we see in the positions of the stars reveals patterns in their orbital motions. 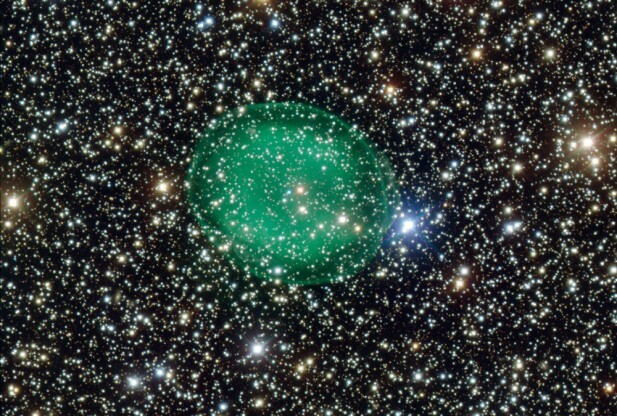 A stellar bar for example reveals a set of very elongated orbits of stars in the disc of a galaxy. Another extraordinary thing about a disc galaxy is how thin it is. To put this is perspective I’ll give you a real world example. In the Haus der Astronomie in Heidelberg you can walk around inside a scale model of the Whirlpool galaxy. The whole building was laid out in a design which reflects the spiral arms of this galaxy. 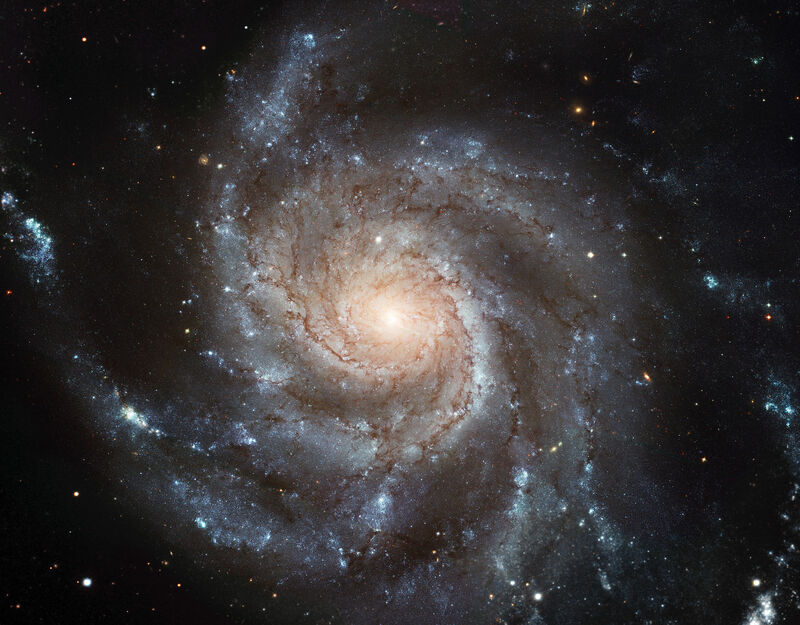 However it’s not an exact scale model – to properly represent the thickness of the disc of the Whirlpool galaxy the building (which in actual fact has 3 stories and hosts a fairly large planetarium in its centre) would have to be only 90cm tall….. The Haus der Astronomie, a building laid out like a spiral galaxy. (1) the fact that not all disc galaxies have bars was put forward as evidence that the discs must be embedded in massive halos before the existence of dark matter was widely accepted. (2) we still don’t understand why not all disc galaxies have bars. M101 – an unbarred spiral galaxy (Credit: ESA/NASA HST). What this second fact means is that perhaps what I should really be doing is studying the galaxies you have identified as not having bars to figure out why it is they haven’t been able to form a bar yet. It should really be the properties of these which are unexpected….. We find that this is more likely to happen in blue, intermediate mass spirals with a significant reservoir of atomic hydrogen (the raw material for future star formation). In fact this last thing may be the most significant. Including realistic interstellar gas in computer simulation of galaxies is very difficult, but people do run what is called “smooth particle hydrodynamic” simulations (basically making “particles” of gas and inserting the appropriate properties). If they add too much gas into these simulations they find that bar formation is either very delayed, or doesn’t happen in the time of the simulation….. Anyway I hope this has given you a flavour of what I find interesting about bars in galaxies. I think it’s fascinating that they give us a morphological way to identify a process which is so dynamical in nature. And it’s a very complex process, even though the basic physics (just orbits of stars) is very simple and well understood. Finally, I have become convinced though tests of the bars identified by you in Galaxy Zoo compared to bars identified by other methods, that if you want a clean sample of very large bars in galaxies that multiple independent human eyes will give you the best result. You are much less easy to trick that automated methods for finding galactic bars. Here’s a link to all blog posted tagged with “bars”. I am very happy to present the results from the first published paper based on your classifications of the HST-CANDELS Images. Galaxy Zoo: CANDELS combined optical and infrared imaging from the Hubble Space Telescope, which allows us to probe galaxies back to when the universe was only around 3 billion years old (early than we could do with optical HST images alone). So we are looking at galaxies whose light has taken over 10 billion years to reach us! Our first area of research with this data is to look at disk and barred disk galaxies, as the title suggests……. This work is based on an initial sample of 876 disk galaxies, which are from the Cosmic Assembly Near-Infrared Deep Extragalactic Legacy Survey (CANDELS). We want to explore what happens to barred disk galaxies beyond eight billion years ago, building on our work looking at the evolving bar fraction with Galaxy Zoo: Hubble. have settled down enough to form barred structures. 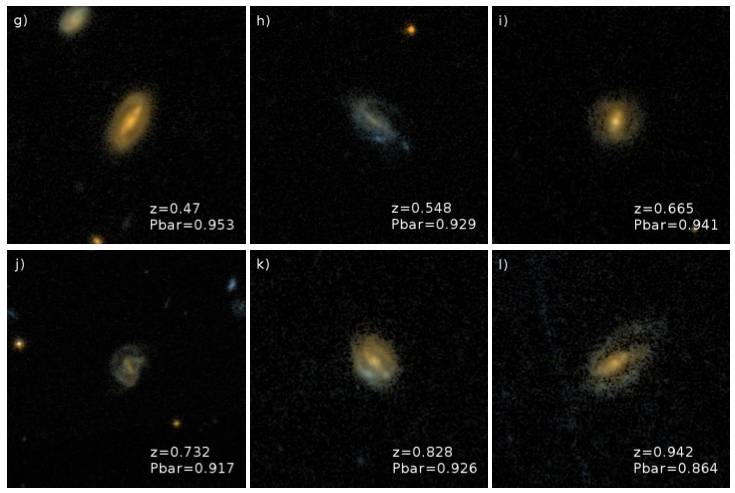 Figure 1: The bar fraction of GZ: CANDELS galaxies (top), and the absolute magnitudes of all the disk and barred disk galaxies in the sample (bottom) (Figure 5 in the paper). As Figure 1 shows, we actually find that roughly 10% of all disk galaxies host a bar, even back to when the Universe was only 3 billion years old! This is a very exciting result, as it shows that disk galaxies were able to settle at much earlier times than originally believed. What we need to understand now is how do these disk galaxies form their bars? Could they be completely settled disk galaxies which have naturally formed bars, even during this epoch of violent galaxy evolution where galaxy mergers are more frequent? Or were these bars formed by a galaxy-galaxy interaction, as seen by some simulations? The answer could be one or the other, or most likely a combination of these two theories. Either way, we hope to explore this population of barred disk galaxies in greater detail over the coming months! 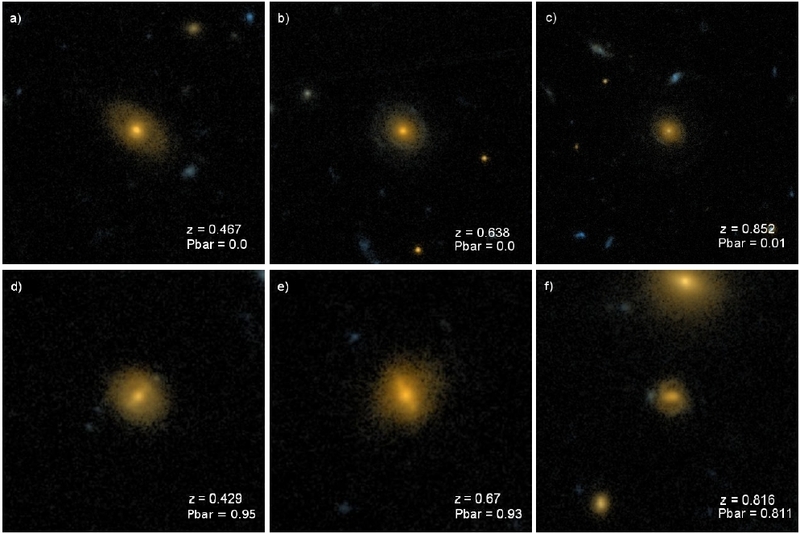 Figure2: Examples of disk (top row) and barred disk (bottom row) galaxies from Galaxy Zoo: CANDELS (Figure 3 in the paper). So there is a summary of the first Galaxy Zoo: CANDELS paper. If you would like to see this in more detail, please take a look at the paper here, and why not check out the RAS press release too! Thank you all for your hard work, and keep classifying! Posted on behalf of Tom Melvin. Hello everyone, my name is Tom Melvin and I’m a 3rd year PhD student at Portsmouth University. I have been part of the Galaxy Zoo team for over two years now, but this is my first post for the Galaxy Zoo blog, hope you enjoy it! I’m very happy to bring you news of the latest paper based on Galaxy Zoo classifications, and the first paper based on Galaxy Zoo: Hubble classifications. 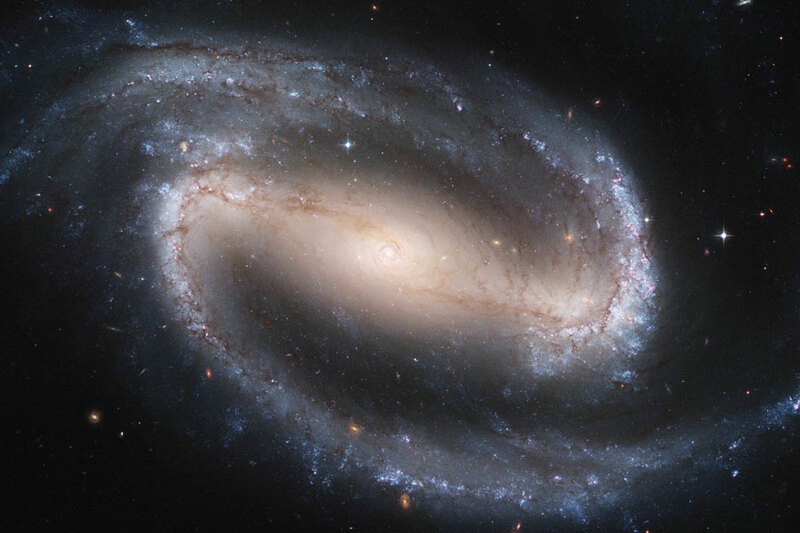 Galaxy Zoo: Hubble was the first Galaxy Zoo project to look at galaxies beyond our local universe, using the awesome power of the Hubble Space Telescope. These images contained light from galaxies which have taken up to eight billion years to reach us, so we see them as they appeared eight billion years ago, or when the universe was less than half its current age! So what is the first use of this data? Well, we combine our Galaxy Zoo: Hubble classifications with Galaxy Zoo 2 classifications to explore how the fraction of disk galaxies with galactic bars has changed over eight billion years. Our work is based on a sample of 2380 disk galaxies, which are from the Cosmic Evolution Survey (COSMOS), the largest survey Hubble has ever done. To see how the bar fraction varies over such a large time-scale, we look at the number of disk galaxies and what fraction of them have bars in 0.3 Gyr (300 million year) time steps. In Figure 1 we show that eight billion years ago only 11% of disk galaxies had bars. By 4 billion years ago this fraction had doubled, and today at least one third of disk galaxies have a bar. Figure 1: The evolving bar fraction with cosmic time (Figure 7 in the paper). We know that bars tend to only form in disk galaxies which have low amounts of atomic gas and are in a relaxed state, or what we call ‘mature’. Combining this knowledge with our observations, we can say that, as the Universe gets older, the disk galaxy population as a whole is maturing. To see whether this is true for all disk galaxies, we split our sample up into three stellar mass bins, allowing us to look at the evolving bar fraction trends for low, intermediate and high mass disk galaxies. The results for this are shown in Figure 2, where we observe an intriguing result. The bar fraction increases at a much steeper rate with time for the most massive galaxies (red), compared to the lower mass galaxies (blue). From this we can say that the population of disk galaxies is maturing across the whole stellar mass range we explore, but it is predominantly the most massive galaxies which drive the overall time evolution of the bar fraction we observe in Figure 1. At the end of the paper we offer an explanation as to why the time evolution of the bar fraction differs for varying stellar mass bins. We can make the reasonable assumption that, by eight billion years ago, the majority of massive disk galaxies have formed, and have been, and continue to form bars up to the present day – hence the steeply increasing bar fraction we observe. However, the same assumption is not true for the low mass galaxies. There are some which are ‘mature’ disk galaxies eight billion years ago, but not all are ‘mature’ enough to be classified as disks. As with the most massive galaxies, these low mass disks are forming bars at a similar rate up to the present day, but the difference with this low mass sample is that there are still low mass disks forming up to the present day as well – leading to the much shallower increase in the bar fraction with time we observe. In addition to these results, we are also able to present an interesting subset of disk galaxies. 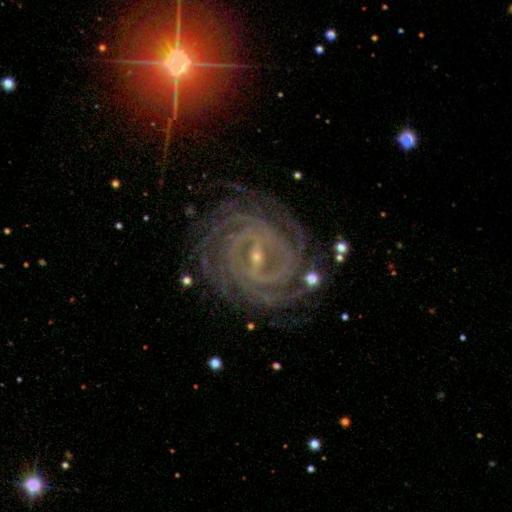 Your visual classifications has allowed our work to include a sub-sample of ‘red’ spiral galaxies (like those found from Galaxy Zoo 2 classifications). This sub-sample is generally omitted from other works that have explored this topic, as their way of identifying disks is based on galaxy colours. This means that these ‘red’ galaxies would have been classified as elliptical galaxies! Figure 3 shows a few of these ‘red’ disk galaxies (with the full sample of 98 here), so why don’t you take a look and decide for yourself! Not only is it very cool that you are able to identify these ‘red’ disks, but they also influence the results we observe. Just like in our local universe, these ‘red’ disks have a high bar fraction, with 45% of them having a bar! Could this be a further sign that bars ‘kill’ galaxies, even at high redshifts? 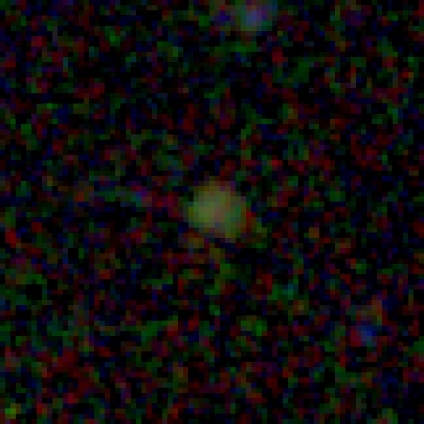 Figure 3: A sample of ‘red’ disk galaxies found by Galaxy Zoo volunteers (Figure 10 in the paper). So that is a summary of the first results from Galaxy Zoo: Hubble. If you want more detail have a read of the paper in full here and take a look at the press release too! Thanks for all your hard work and help in classifying these galaxies! We’re Observing at the Very Large Array! I’m really excited to be able to post that galaxies selected with the help of Galaxy Zoo classifications are being observed at the VLA (Very Large Array) in New Mexico, possibly right now. It’s the Very Large Array! The funny thing about observing at the VLA is that you do all of the work for the actual observations in advance. The VLA runs in queue mode – as an observer you have to submit very (very) detailed information about what you want the telescope to do during your session (called a “scheduling block”) and a set of constraints about when it’s OK to run that (for example you tell them when the galaxy is actually up in the sky above the telescope!). Then the telescope operators pick from the available pool of scheduling blocks at any time to make best use of the array. This means after you submit the scheduling blocks you just have to sit and wait until you start getting notifications from VLA that your galaxies have been observed. The observing semester for the B-array configuration started on 4th October (had a pause for the US shutdown) and runs until the 13th January 2014. I’m happy to report that we started getting notifications in late November of the first of our 2 hour scheduling blocks having been observed. At the time of writing four of our galaxies have each been observed at least once (we need six repeat visits to each one to get the depth of data we’d like) for a total of 16 hours of VLA time. I’ve been getting notifications every couple of days – which means that as I write this the VLA could be observing one of our galaxies! Since making these very detailed observation files is the observing prodecure at the VLA – it takes the length of time you’d expect given that….. 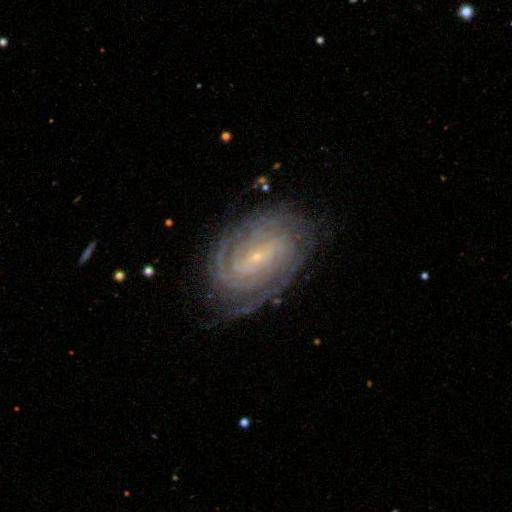 So, in September in-between a crazy travel schedule, and with a lot of help from our collaborator Kelley Hess at Cape Town, I spent a lot of time scheduling VLA observations of some very interesting very gas rich and very strongly barred galaxies we identified in the Galaxy Zoo 2 sample (the bit which overlaps with the ALFALFA survey which measures total HI gas in each galaxy). We have been granted time to observe up to 7 of these fascinating objects (depending on scheduling constraints at the VLA) which I think may reveal some really interesting physics about how bars drive gas around in the discs of galaxies. 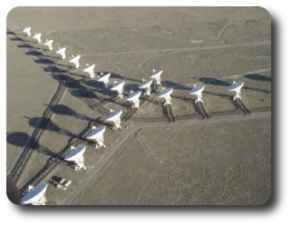 You might notice from the picture (and the name) that the VLA is not a “normal telescope”. It’s what astronomers call a radio interferometer. Signals are collected from 27 separate antennas and combined in a computer. This means that as well as observing sources for flux calibration (so we can link how bright our target is through the telescope with physical units) we also have to observe, roughly every 20 minutes or so a “phase calibrator” to be able to know how to correctly add the signals together from each of the antennae (to add them “in phase”). 1. Information to tell the VLA where to slew initially and what instrumentation to use (how to “tune” it to the frequency we know the HI in the galaxy will emit at). 2. A short observation of a known bright source for flux calibration. and so on – ending with a Phase calibration (on Kelley’s advice we’ll do 5 source observations, and 6 phase calibrations). We have a total of 6 of these blocks for each galaxy, that makes 12 hours of telescope resulting in about 10 hours of collecting 21cm photons per galaxy. We have to check which times all these sources are visible to the VLA, and set durations for each part which give enough slew time and on source time wherever the sources are on the sky. And this all has to add up exactly to 2 hours to fit the scheduling block. The benefit of this though is a telescope which acts like it’s much larger than you could ever physically build. We’re trying to detect emission from atomic hydrogen in these galaxies which emits at 21cm. So we need a really large telescope to get a sharp picture. And just to end, because they’re lovely, here are the four galaxies the VLA has observed so far in the Sloan Digital Sky Survey visible light images. Thanks again for your help finding these rare and interesting galaxies. They’re rare, because they’re so gas rich and strongly barred – we have previously posted about how we showed strong bars are rare in galaxies with lots of atomic hydrogen. Hopefully we’ll have some exciting results to share once we’ve analysed these data. (PS. That takes a lot of time too – it’ll be almost 1TB of data to process in total!). A quick post to say congratulations to new Galaxy Zoo science team member Edmond Cheung, a PhD student from UC Santa Cruz, on the publication of his first Galaxy Zoo paper. Edmond approached us some time ago and was interested in doing further study on the barred galaxies in both Galaxy Zoo 2 and GZ: Hubble. This paper is the result of the excellent work he’s done looking at more detail on the properties of bars in the Galaxy Zoo 2 classifications. The paper has recently been accepted to the Astrophysical Journal, and will appear on the arxiv very shortly. The main result is a stronger proof than has ever before been seen that secular (that is, very slow) evolution affects the properties of barred galaxies, which grow larger bulges and slow down in their star formation the longer the bars grow (or the older the bars are). Readers may be interested in some of the presentations now online from a conference I attended last month on “The Role of Bars on Galaxy Evolution”, held in Granada. You get to the presentations from links in the pdf version of the program – my talk on Galaxy Zoo related bar results was on the first day.